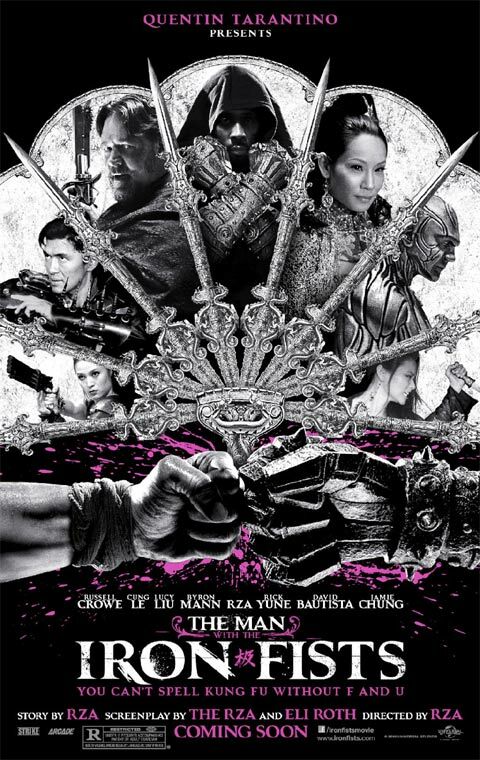 Trailer & Poster for RZA's "The Man with the Iron Fists"
The poster and trailer for RZA's upcoming flick "The Man with the Iron Fists" has finally dropped today! The film was announced in 2008 but was first planned way back in 2005. RZA writes, directs, stars and scores this $20 million passion project and describes it as a mashup of classic Kung Fu cinema, the spaghetti western genre, and “hip hop influence.” It is set in Feudal China and RZA plays a blacksmith who creates some iron gloves to protect his village. RZA's inexperience as a director has me a bit worried (we all saw what happened with Frank Miller's The Spirit) but I have high hopes. At the very least we can expect a big budget version of old Shaw Brother's style cinema. The movie is co-written by Eli Roth of Hostel fame and also stars Russell Crowe, Lucy Liu, Pam Grier, UFC fighter Cung Le, Byron Mann, Grace Huang, Daniel Wu, Jamie Chung and Rick Yune. It is presented by Quentin Tarantino.